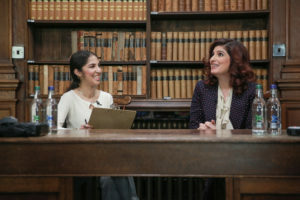 Bestselling female Indian author, film producer and woman empowerment champion Twinkle Khanna, joined a canon of esteemed cultural, political and high profile figures as she addressed students at The Oxford Union, the world’s most prestigious debating society. The event came ahead of the worldwide release of her highly anticipated debut as producer, Pad Man, in cinemas 25th January 2018. The day also saw a meeting between Twinkle and youngest Nobel Peace Prize laureate and Oxford University student Malala Yousafzai to discuss the education of girls. Popularly known to her readers as Mrs Funnybones, which also doubles up as the title of her first book and columns, Twinkle Khanna’s debut book Mrs Funnybones sold over 100,000 copies. This feat made her the highest-selling female author in India with her second book, The Legend of Lakshmi Prasad, landing at number two on Amazon India’s bestseller list. The Legend of Lakshmi Prasad featured a number of short stories, one of which was the story of a man who invented a machine to make low-cost sanitary pads. Recognising a vital need to have this story shared to a wider audience, Twinkle had turned producer to develop it for the big screen. The result is her latest endeavour, Pad Man, the world’s first feature film on menstrual hygiene, based on the life of social entrepreneur and activist Arunachalam Muruganantham, who revolutionised sanitary hygiene in rural India 20 years ago. Pad Man traces Arunachalam Muruganantham’s international journey from an outcast exiled from society for his endeavours to delve into such a taboo subject, to becoming a super-hero of India’s modern history, as he followed his dream to bring a revolution to menstrual hygiene in India. Eager students flocked to The Oxford Union to see Twinkle Khanna’s highly anticipated speech and Q&A session, in what marked the first time for an Indian film to be showcased at the institution. Before Twinkle took to the spotlight, the audience were presented with the official trailer of Pad Man, which generated a rapturous response of laughter when lead actor Akshay Kumar remarks that if a man bled for the amount of time a women did as a result of menstruation – he would die. In the Q&A session that followed her speech, Twinkle asked an audience filled with Oxford University students to raise their hands if they were currently on their periods. When almost three quarters of the room raised their arms aloft, Twinkle said “Now imagine sitting here with a rag cloth or a rolled up sock or even wadded up newspaper between your legs. Would it even be possible for you to study under those circumstances? Approaching its 200th anniversary, The Oxford Union has an unparalleled reputation for bringing international guests and speakers to Oxford, with the aim of promoting debate and discussion not just in Oxford University, but across the globe. Former participants include US Presidents Reagan, Nixon, and Carter, Sir Winston Churchill, Albert Einstein, Malcolm X, Mother Teresa, Sir Elton John, the Dalai Lama, Michael Jackson, Malala Yousafzai, Morgan Freeman, Shashi Tharoor, and Buzz Aldrin, to name but a few. 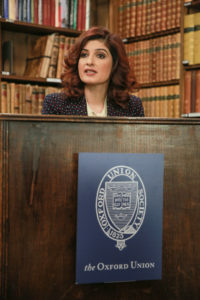 Twinkle Khanna’s participation continues The Oxford Union’s fine tradition of hosting world leaders in every field. Pad Man releases in cinemas worldwide on the 25th January to inspire all the cape-less heroes amongst us, through SPE Films, India.